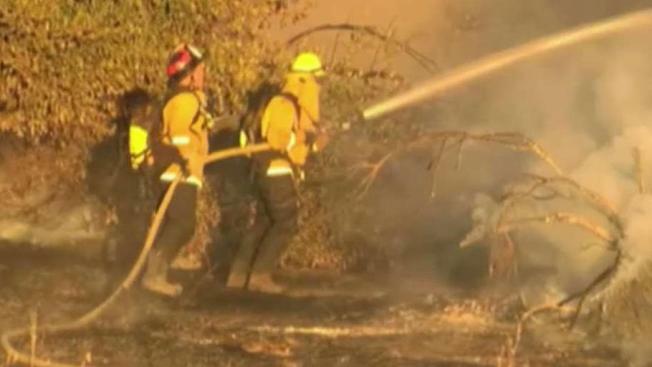 A series of brush fires late Friday along Highway 4 in Martinez threatened several homes before officials brought the flames under control, according to the Contra Costa County Fire Protection District. The fires broke out along Hwy. 4 between Alhambra Way and McEwen Road just after 7 p.m. and it quickly prompted a three-alarm response. More than 30 acres have burned and the flames are 50 percent contained. "I came out and I saw an orange glow in the sky and a ton of smoke," said Martinez resident Lisa Kennedy. "It was very close and very scary and a little too close to home." Fire officials said several homes were threatened in the Martinez Hills before fire crews put out part of the blaze with the help of an aircraft from Cal Fire. "The fire was threatening homes for a time. We got a number of units up there to the homes we didn’t have any homes involved," said Robert Marshal from the Contra Costa County Fire Department. The cause of the fire is still unknown though fire cews believe a car could have started the blaze. "Our fire in Walnut Creek the car fire in Redding both both those started by vehicles so it’s important for people to look at their vehicles make sure they are in good repair," said Marshal. ConFire, and supporting agencies, attacking a 30-acre, three-alarm vegetation fire in the vicinity of Alhambra Road on Hwy 4. Expect closures on Hwy 4 and vicinity. Please avoid the area.